The Fortieth Pacific Islands Forum was held in Cairns, Australia from 5 to 6 August 2009 and was attended by Heads of State and Governments of Australia, the Cook Islands, Federated States of Micronesia, the Republic of Nauru, New Zealand, Niue, Papua New Guinea, the Republic of the Marshall Islands, Samoa, Solomon Islands, Tonga, Tuvalu and Republic of Vanuatu and representatives of Republic of Kiribati and Republic of Palau. New Caledonia and French Polynesia attended the formal session as associate members. Timor-Leste, Tokelau, Wallis and Futuna, the Commonwealth Secretariat, the United Nations and the Western and Central Pacific Fisheries Commission attended as observers. The Forum Retreat was held at Whitfield House, Cairns. 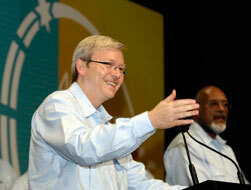 Leaders expressed their deep gratitude to the Prime Minister, the Government and people of Australia for the excellent arrangements made in hosting the 2009 Leaders’ meeting, and for the kind hospitality extended to them during their stay in Cairns. Leaders also expressed their sincere appreciation to the people of Cairns and the Government of the State of Queensland for the warm reception received and goodwill extended during their participation in the 2009 Forum meeting.